Your quick guide to the ultimate Romantic opera, including information about the story, the music, the production, the history of the opera and some fun facts. Jules Massenet, a French composer who dominated the 19th-century opera scene during his lifetime. Born in 1842 in the French town of Montaud, Massenet learned music at his mother’s knee. She was a piano teacher and composer. After his family moved to Paris, Massenet entered the Conservatoire de Paris, aged 11, and studied under renowned composer Ambroise Thomas. He emerged at 21 with the prestigious Prix de Rome prize and began a rewarding career composing operas, ballets and orchestral works. Many are now forgotten, but Manon and Werther are frequently performed today, and the theme from Thaïs is one of the most popular classical melodies in the world. He died from abdominal cancer in 1912, aged 70, with his family by his side. He was buried in Égreville. A portrait of Jules Massenet, taken by photographer Eugène Pirou in 1895. Source: National Library of France. Copyright: Public domain. Werther is in love with Charlotte. His love is passionate, uncompromising. He loves like a poet. But Charlotte is engaged to another, and when she decides to fulfill her obligations, Werther is distraught. The story follows Werther and Charlotte as they grapple with emotions that threaten to overtake their lives. This melancholy tenor aria is a setting of a poem by Ossian. In an effort to distract Werther from his sombre thoughts, Charlotte points him to the poems they used to read together. At the end of Act I, as Werther and Charlotte return from the dance, the orchestra plays a beautiful theme suggesting moonlight, the ‘Clair de lune’. It starts in the strings and swells through the whole orchestra. You’ll hear it again with a new intensity when Charlotte realises her love for him in Act IV. When Charlotte sings her famous ‘Letter Aria’ in Act III, the orchestra sets a melancholy, sombre mood. Listen to the way Massenet uses dissonance (where chords include clashing notes) to reveal her distress. Hear how her vocal line changes in response to what she is reading: happy memories are lighter and brighter, with little flourishes in the orchestra. As she grows more and more emotional, hear how the music surges and recedes. It gets louder and softer suddenly. The music in the strings is constantly moving, reflecting her agitation. A contemporary reimagining of Werther by legendary director Elijah Moshinsky. Each time the production is performed, the costume consultant sources contemporary fashion. That means the production has sported different looks through the ages, from 1989 to 2019. 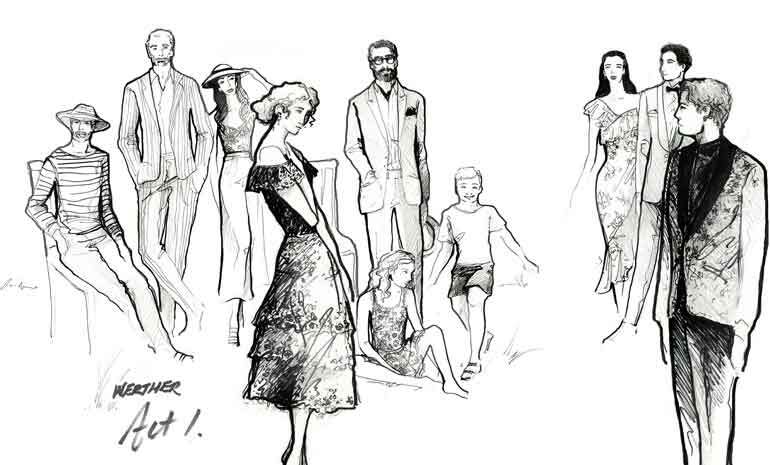 Costume sketches for Act 1 for our 2019 production of Werther, by costume consultant Sabina Myers. If at first you don’t succeed, put it to one side and try again later. That’s what Massenet did with the opera that would become one of his biggest hits. 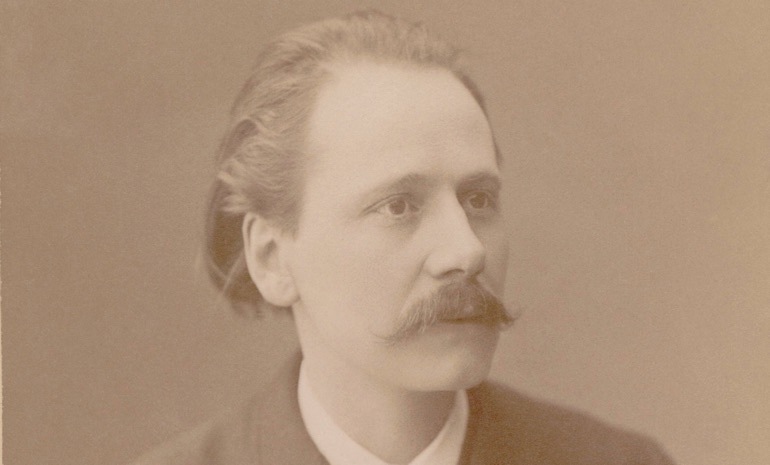 Massenet was already a successful composer when he began working on Werther in 1885. He based it on Goethe’s popular novel, The Sorrows of Young Werther, a passionate story which was so popular in its day that men began wearing the poet’s signature outfit (yellow pants, bright blue coat). In 1887, Massenet offered it to the Paris Opéra-Comique, where his opera Manon had appeared frequently over the previous few years. But the director, Léon Carvalho, thought it was too dark, too serious. His loss. After the Vienna Opera saw Massenet’s success with the local premiere of Manon, they begged the composer for a new work. He gave them Werther, in a new German translation, and the opera premiered in February 1892. It took less than a year for the Opéra-Comique to rectify their mistake, and Werther premiered in France in January 1893. It wasn’t an immediate hit, but within two years, Werther had premiered on stages including the Metropolitan Opera in New York and the Royal Opera in Covent Garden. Today, it’s one of the top 60 works performed around the world, with 67 performances recorded in the 2017/18 season. Massenet had a tendency to fall for his leading ladies, so knew a little something about unrequited love. The story is based on Goethe’s novel The Sorrows of Young Werther, which is often called the original psychological novel. The semi-autobiographical novel was so popular in its day that young men began wearing Werther’s signature outfit (yellow pants, bright blue jacket, if you’re curious). Goethe’s novel also inspired some copycat suicides. (In fact, a spate of suicides following a high-profile suicide is still called the Werther effect.) Several countries banned the book and Goethe distanced himself from it in time. Massenet was a morning person with a disciplined routine. He arose at 4am and worked until midday every day. The composer: Massenet. French. 19th century. The setting: originally set in Germany about 1780, this production is updated to the present era. The costumes are contemporary. The history: Massenet’s national opera theatre rejected Werther at first glance, saying it was too gloomy. Lucky for us, Vienna was willing to give it a go! A quirky fact to impress your date: Goethe’s novel spawned a generation of Sensitive New Aged Guys. Young men cried their anguish into tiny glass vials and wore them around their neck to prove the depths of their emotions.